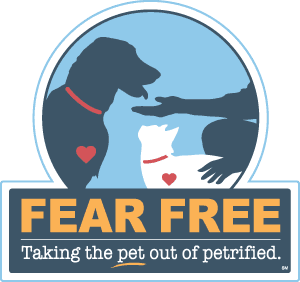 Your veterinary team needs your help to make your pet’s visit as Fear Free as possible. 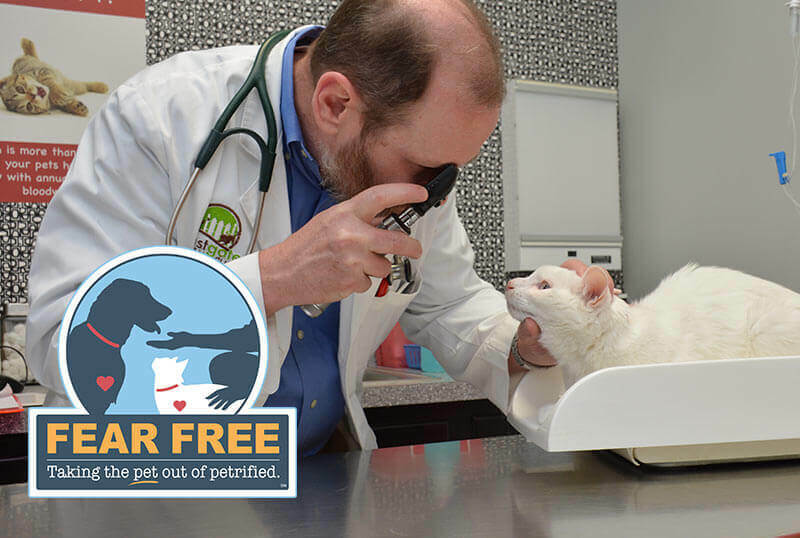 One thing you can do is to ensure that your pet gets to the veterinary hospital in a calm state of mind. The following tips will help you and your pet arrive in one piece and in peace. Your pet should voluntarily go into a carrier or crate or wear a seatbelt harness. Give any prescribed anti-nausea or anti-anxiety supplements or medications as prescribed by your veterinarian. Cats should be resting comfortably in their carrier before being placed in the vehicle. Walk dogs to the car on leash. Like cats, small dogs can get in the carrier indoors and be carried to the car. When transporting your cat or small dog in a carrier, minimize movement. If possible, support the carrier from the bottom, with one side resting against your chest, as if you are carrying a fragile gift. This helps your pet to feel more secure and ensures that he isn’t eye to eye with other animals as you walk into the lobby of the veterinary hospital. Prepare the car so it promotes a calming environment. Apply calming pheromones or scents such as lavender. 6 to 8 sprays of a calming pheromone or 2 or 3 sprays of a diluted lavender scent will suffice. Apply 10 to 15 minutes before your pet enters the carrier or car. Cool or warm the car to a comfortable temperature before putting your pet inside. Nonslip surface in and under carrier/crate or on the car seat. Place a pheromone-infused towel or blanket over the carrier, leaving one side uncovered for ventilation. The floorboard behind the passenger seat is the most secure location for a small pet carrier. Secure large crates or carriers to prevent sliding. Avoid feeling rushed. If you are stressed, your pet will sense this and may become stressed. To prevent carsickness, accelerate slowly from a stop, allow extra distance between other vehicles to prevent sudden braking, and take turns slowly. Cats need five to ten minutes to adjust to their new surroundings and feel safe. If you cannot avoid waiting in the lobby, place your cat’s carrier on an elevated surface & cover the front and two sides with a pheromone-infused towel. Depending on your dog’s preferences, you might wait in the vehicle, take a short walk, or wait in the lobby. Notify the veterinary hospital team when you arrive. Rather than bringing your pet into the veterinary hospital, call the front desk and let them know you are in the parking lot. They can call or text you when the exam room is ready.